As if we hadn’t been blessed enough with a decent month’s weather this spring before the solstice has even hit, we’ve got another blast from the past that’s going to make your season. Just when you thought you couldn’t get enough of a ’90s throwback like a decent bit of sunshine, something so deliciously cool has come along to make your summer even sweeter. 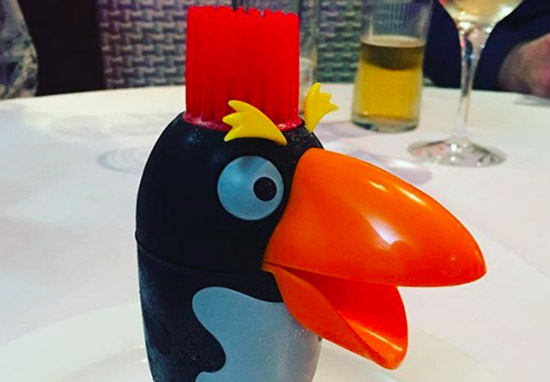 No, we’re not talking sickly sweet ciders or massive pints to get you through the World Cup, make some room for dessert because Punky Penguin ice creams are back. Yep, those funny plastic guys with the crazy hair and the delish vanilla ice cream have returned. And before you get ahead of yourselves, and assume they’re only available in Australia or Japan for a limited time only, hold your beach donkey, because these are on sale. In the UK. Kinda. They’re available through Holdsworth Foods – a trades wholesalers – so go to their website, have a little think about who you know who works in the catering industry and ask them really bloody nicely if they’ll do you a favour. The Punky Penguins come in packs of 12 for a reasonable £20.40, so you could chuck a few in your friend’s direction. They won’t be disappointed. And if your on the hunt for more nostalgic ice cream childhood memories to come flooding back – M&Ms have released a new Neapolitan ice cream flavoured version of the sweet treat. Again, a bit of a pain in the backside for this one but worth all the effort because these are only available in the US. But this weather’s not going to last forever, so maybe a trip abroad might be worth the effort once we’re dumped out of the World Cup?